I am so glad to have found this site. We have a Brother DB2 B714-3 machine. 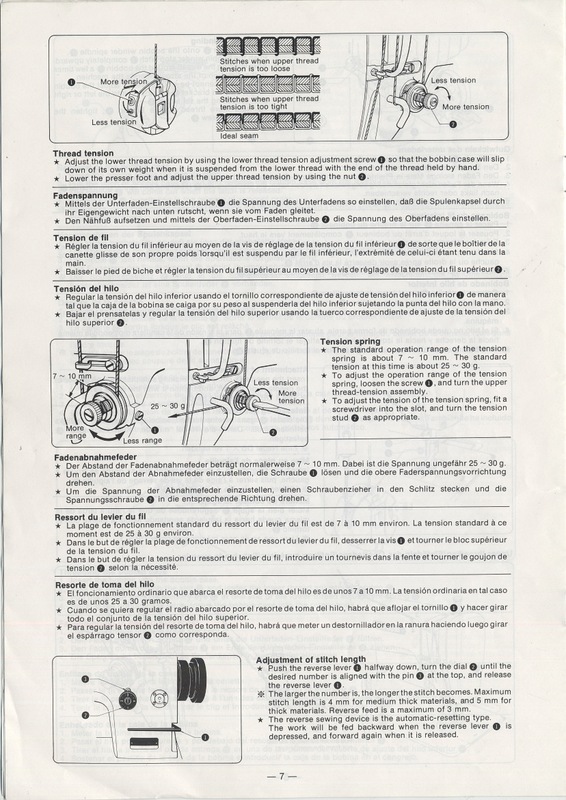 The rotating hook assembly became jammed due to a thread being caught between the stationary and rotary bobbin holder. The item had to be completely removed and the inside bobbin holder freed. Problem arose when sliding the unit back on its shaft and setting the needle-hook timing (and distances) correctly. I could not have done so without the guidance given on page 11 of your posted manual. Thank you so much. It is very good to hear that this is a helpful tool for you, and anyone else. Thank you. 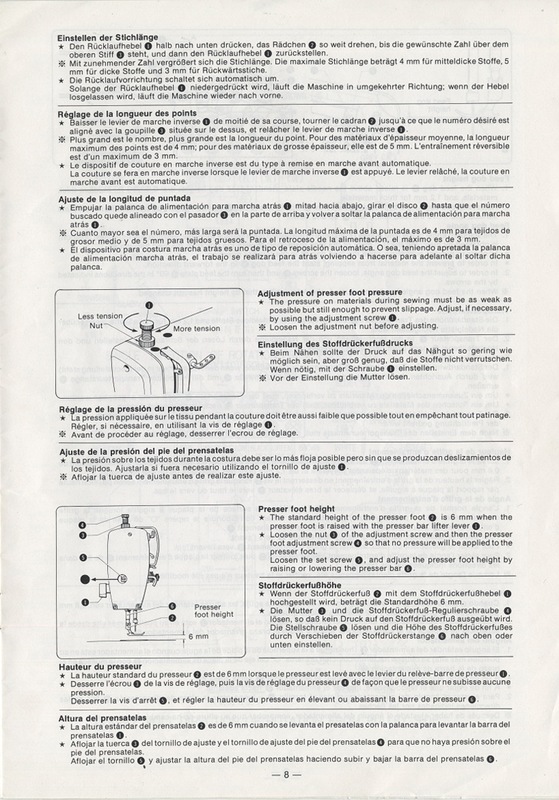 I am looking for an owner’s manual for the Brother DB2-B714-3. Can you help me find this? I have one and have it for sale, but the lady wants to know if it reverses so you can lock in stitches. She also wants a copy of the owner’s manual if we can find one. If your Brother DB2-B714-3 machine matches this one – http://www.imsmachines.com/brother-DB2-B714-3.html – then you are in luck and it does have reverse. The reverse mechanism is the flat padel shaped lever on the right of the body of the machine’s head, when you depress it, the machine will reverse the feed to lock in your stitches. Another thing to note, is that you need to hold down this padel/lever when you adjust the stitch length, that is how the machine is designed. Also, when you depress the reverse lever, if you only hold it down halfway or less it will actually stitch more stitches per inch, when you depress the reverse lever completely it will stitch how many stitches the stitching length has been set to. 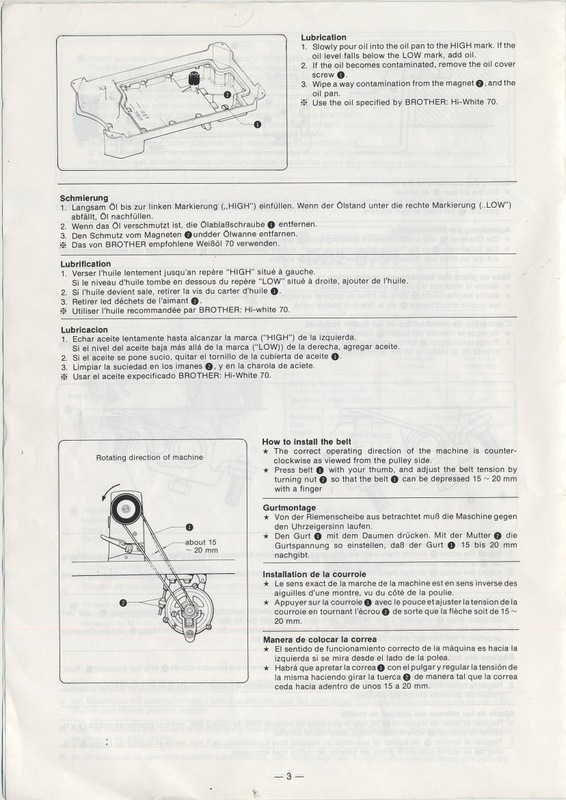 Unfortunately, we were not able to locate a proper manual, but one other site that is good for manuals is Sewing-Machine (in the right hand column of this site is a link). I have an opportunity to buy a Brother DB2-B714-3 and the seller can’t tell me much about it. Do you know what year they were made and is it a good machine for making draperies, pillows, cushions, etc? This machine has become quite the topic. Although it is hard to find any info on the age of this machine (Brother DB2-B714-3), it is probably fair to say it is somewhere between 20 and 25 years old, most likely closer to 20 years. However, for an industrial machine this would mean it is still in it’s youth, a 20 year old machine is as young and sprightly as a 20 year old human. 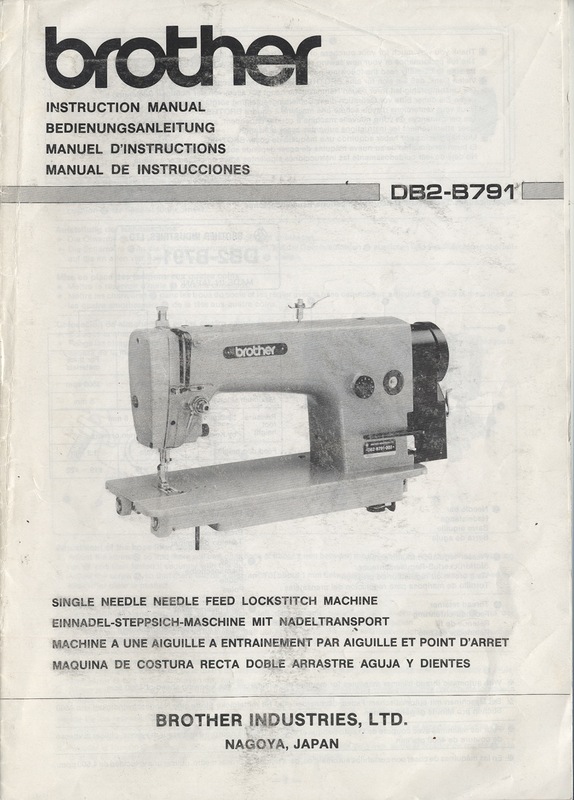 The Brother DB2-B714-3 is a single-needle straight-stitch lock-stitch machine. It will be easy to use, and provided there are no unforseeable problems, will last a long time for your purpose. becuase it has the designation “-3” that means it is meant for middle weight materials, which in the case of curtains, pillows, cushions is more than enough. You will even be able to sew through heavier materials once you have gotten to know the machine a little better and have a stronger understanding of how to adjust the thread tension. Food for thought. Before we had the Brother DB2-B791-015, we used a Singer600W1 – which is probably 25 years older than this Brother DB2-B714-3, but uses the same basic functions. With that Singer almost anything could be sewn once the proper adjustments were in place. For very heavy materials you can purchase different feed-dogs, and throat plates, also don’t forget to use the proper needles, and needle sizes for the application. All in all, the Brother DB2-B714-3 will be a good machine for what you are doing. It will also be versatile if you wish to sew heavy items. But, as always, without actually-physically sitting at the machine and testing it out, we cannot promise that this PARTICULAR machine is ready for use. Common sense should be inplay when buying used items from private parties, whether it is a sewing machine, a car, or a computer. 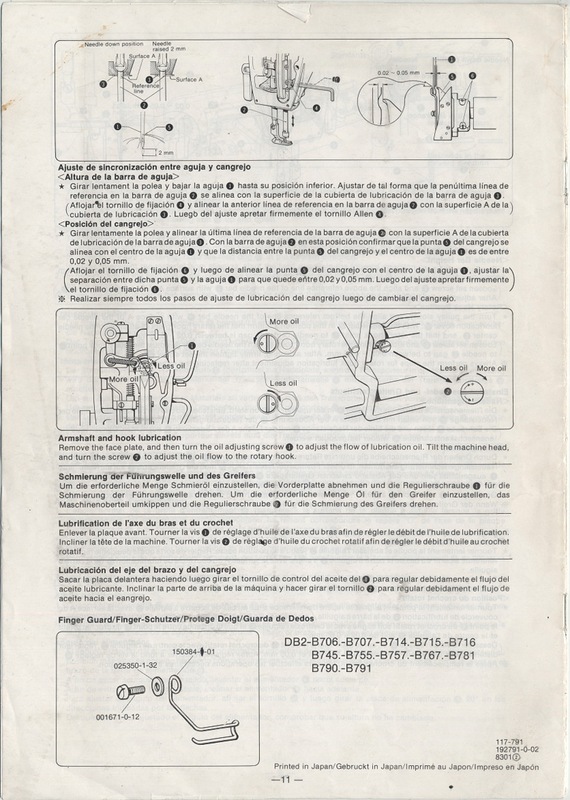 The instructions in the manual posted here match my machine very closely. Handy to have! I just changed the oil after pulling the pan and completely cleaning it. I adjusted the belt, wiped everything down and got the last bits of lint/dust out of the nooks and crannies. Sews like a bat out of hell. This machine was once owned by a tailor from Hong Kong. It was kept at his son’s house in SF, and he would use it when he visited the states. It was later sold to the man I bought it from who used used it briefly, then bought a heavier Consew walking foot machine. Basically this machine was rarely used for over 20 years. I will be stopping by here often. Great source of info and inspiration. Right On, Evo. Sounds like you have a great machine, and from the picture – it is in fantastic condition. No doubt that being in the bay area (as it sounds) will give you plenty of resources to find any miscellaneous parts you may need, now or in the future. Happy Stitching, Brother DB2 & Co.
Evo (or anyone else) – I am doing some trouble shooting on my Brother DB2-B735-3. I am having a couple of problems. For some reason, the machine sews in the reverse, and moves forward only when the reverse level is pressed. Another problem is that although I can correctly thread both the upper and lower threads, they do not work in conjunction to make stitches. The are my main 2 probs. Other than that, is there any way to adjust the speed so it does NOT sew like a bat out of hell? Thanks for any and all advice! Phew, these are a few tough questions to answer over the inter-webs (i.e. without seeing the machine in the flesh). First off the easiest question dealing with the machine sewing like a bat out of hell (this is a good thing overall). If you have a servo motor it is possible that you can adjust the speed via a dial, OR, if you have a clutch motor, the only true way to tune the machine down is to replace the pulley on the right side of the motor. You would want to shoot for the pulley’s either being the same size in diameter, or have the pulley on the motor slightly smaller in diameter as compared to the pulley/hand wheel on the machines head (where the belt connects at the top). As for the stitching not working, Are you positive that you are threading it correctly? And by “not making stitches” do you mean not-at-all, or is it making bad stitches (messy, or uneven tension, let’s say) If you are threading the components correctly, is the needle in the machine facing the right direction? As you sit at the machine place the needle into the needle bar with the long groove facing to the left of the machine, and the very short groove facing to the right. 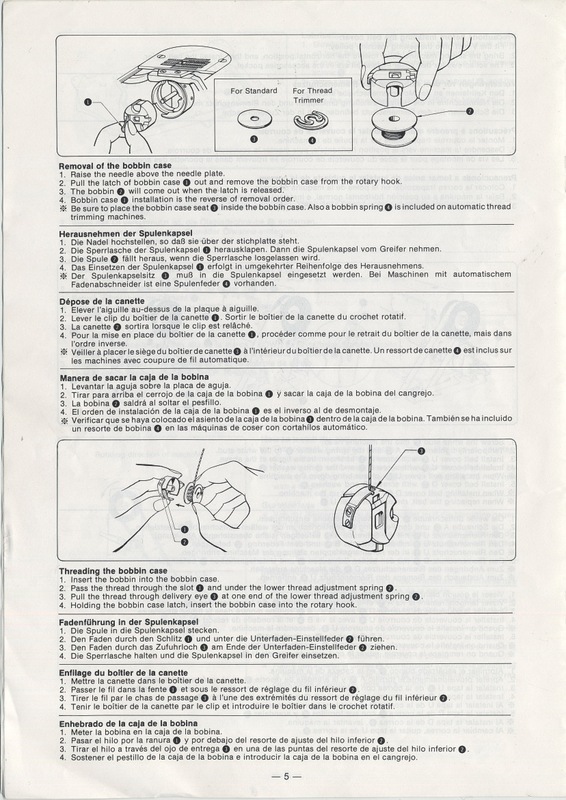 That short groove, which is only at the tip of the needle where the thread is inserted must be facing perfectly to the right or the hook will not catch the thread on the “take up” – this is crucial for proper timing. Also you may want to check the the needle bar height is appropriate. To do this take the throat plate and the feed-dog off of the machine and and without any thread take a look at the downward motion of the needle. When the very short groove of the needle (as mentioned before) which is at the eyelet for the thread gets to it’s lowest point it should meet exactly with the hook as it passes by whilst spinning. Also of course check your tensioning. Lastly, for the problem of reverse vs. forward. This you will have to really look into the machine, possibly the mechanism was altered, replaced, “fixed” some time ago and was installed backwards, causing the motions to run counter-actively. Or, is the lever somehow jammed in the wrong position so the only option for moving it appears to be the wrong way in regards to the feed of the machine. We would bank on the problem being an internal error. Thanks so much for this instruction manual. I even emailed Brother for one and they didn’t reply, so you saved my bacon. At last the maintenance man will get off my back! We are very happy to save bacon. Hi, I’m just wondering exactly where the oil is suppose to go? I know it goes under the machine, but where else? The pictures aren’t so clear. Well, the oil is poured into the oil pan underneath the machine head. From there it is distributed throughout the machine via pumps. 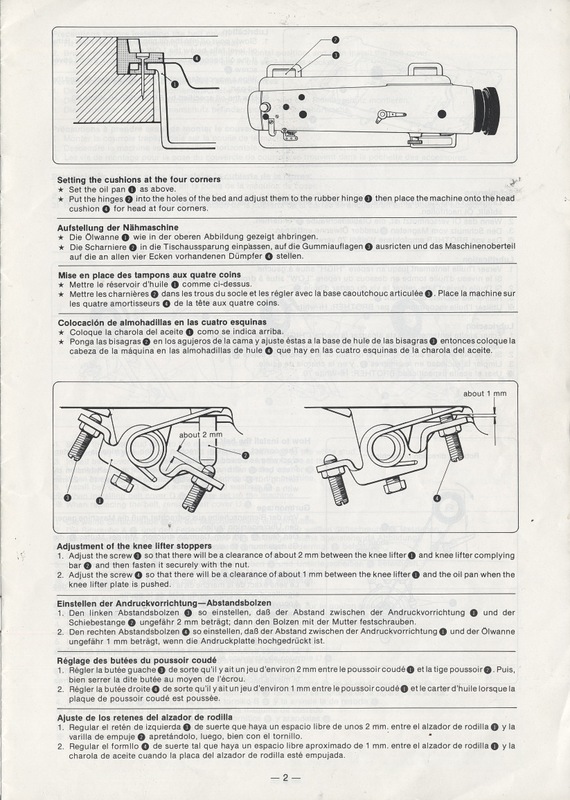 In essence you only need to pour oil into the oil pan (again, the cavity suspended underneath the machine head), and then the machine will take care of the rest. However, not all machines have oil pans. Some have small reservoirs attached at the bottom of the base plate of the head, in this scenario one would generally have a small port to pour oil into on the top side of the base plate, and from there the oil is pumped or wicked into the machine. 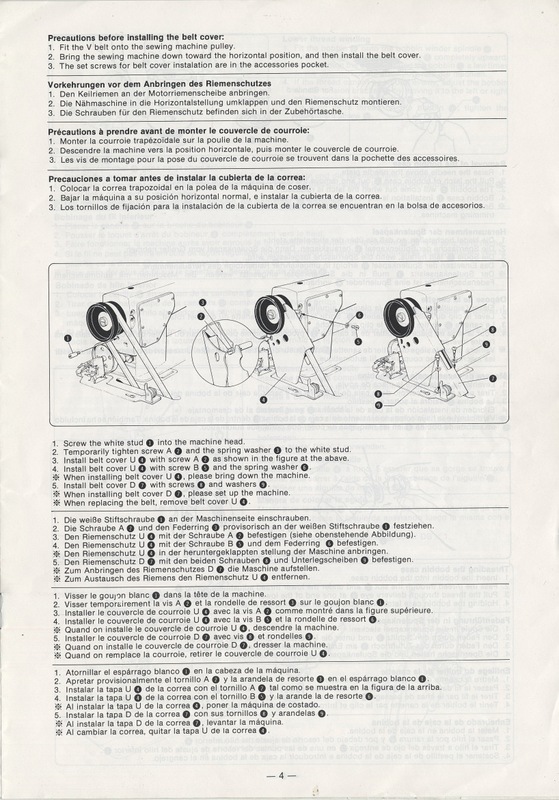 In the case of home sewing machines, it is entirely different, one would need to open the machine up and drop oil on any parts that have bushings or relate the movement of two objects against each other. Is there any way to lower the teeth? My daughter has bought this machine to sew leather and the teeth are leaving marks on the leather. There is not a way to lower the teeth (the feed-dog). 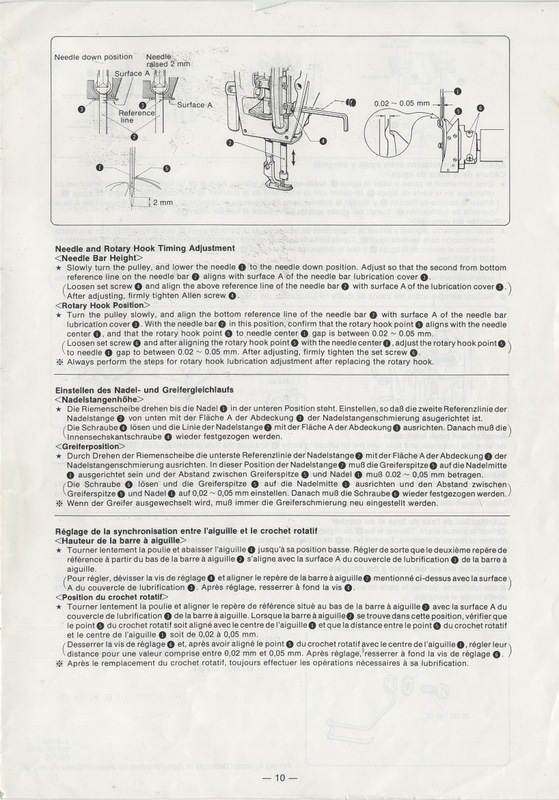 Any experimental adjustment like this would compromise the machines intended use and quality of stitch – opening a whole new set of problems. However, what you can do is buy a new feed-dog for your machine with finer teeth. Feed-dogs come with different sized and amounts of teeth, essentially from a course “bite” to a fine “bite”. The more course the teeth on a feed-dog will also mean fewer teeth: these are used for very heavy materials like leather, canvas, and denim. With that said not all leather requires such a heavy feed mechanism. So, you could purchase a feed-dog with a finer/smaller bite – which in theory would reduce the impression that it makes in the leather. However that may compromise the machines ability to feed the leather past the needle properly. Now: feed-dogs aside there are two things to check on your machine. Make sure the throat-plate (the “D” shaped plate screwed to the bed of the machine under the needle) is properly seated and flush against it’s recessed area, if it were broken or somehow to thin (very unlikely – almost impossible to happen or even imagine) it would allow the feed-dog to bite into the chosen materials more. 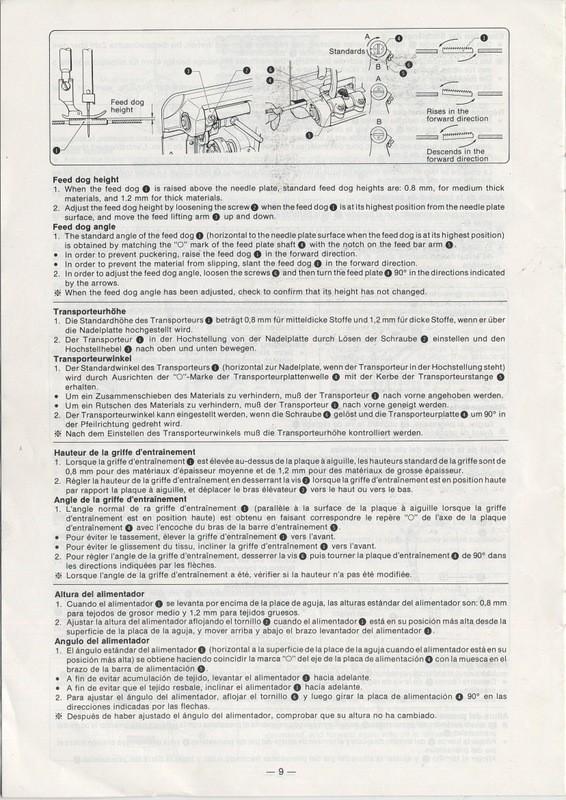 And/or reduce the downward pressure of the needle-bar, this can be done on the top of the machine: with home machines it is usually a small toggle knob that rotates back and forth, and on industrial machines it is a large screw (pressure regulation thumb screw item #2 in the diagram) on top of the machine head – directly over the needle-bar (the bar that the actual needle is mounted into). To reduce the pressure of the needle-bar unscrew this heavy bolt and then re-set the locking nut (it is a two part process). Foot pressure may not help but it worth a try: remember that as you reduce foot pressure the machine will also reduce it’s ability to hold a straight stitch. I would like to thank you for this site! my son found it after someone letting me try-out to see if I would like to buy a brother. The industrial machine is hard to find sites that will help you. one wanted 15.00 plus shipping for instructions. mine did not come with any so i had no idea how to thread, and it is alittle overwelming being so industrialist. i had it overhauled at mason’s on fraser good site for machines. very nice and knew about this machine but no manual thanks to you with the help of my son, we had to thread it and using your instructions it was a breeze. the only thing is it is to fast! a little scarey. Thanks again for this site. You are very welcome! If the machine is running a bit fast for your pace, you can swap out the pulleys to slow down the gear ratio (assuming you are using a clutch motor). Otherwise, it is just a matter of time that you will become used to the extra swiftness of your machine and learn the tricks to controlling the speed with your foot on the pedal. Goodluck! That sounds like a hard fix to troubleshoot over the web. Are you saying the oil is coming from the upper pulley that the belt is attached to, or is the oil coming out from underneath the machine? It sounds like you have a protector cap that isn’t seated correctly, or isn’t properly torqued down. Hmmm? You post interesting content here. Your blog deserves much more traffic. Hi, i’m looking at buying a second hand Brother DB2-B714-3 and would love some advice. I am making belts and the area around the buckle turns out to be heavy duty. I’m not using leather, but fairly heavy upholstery material, i.e. canvas/wool/heavy-duty interfacing. It wrecked the timing on my regular Kenmore machine. I was advised to buy a light duty industrial machine with straight stitch walking foot. Industrial machines are completely new to me. Can anyone tell me if this machine would do the job? 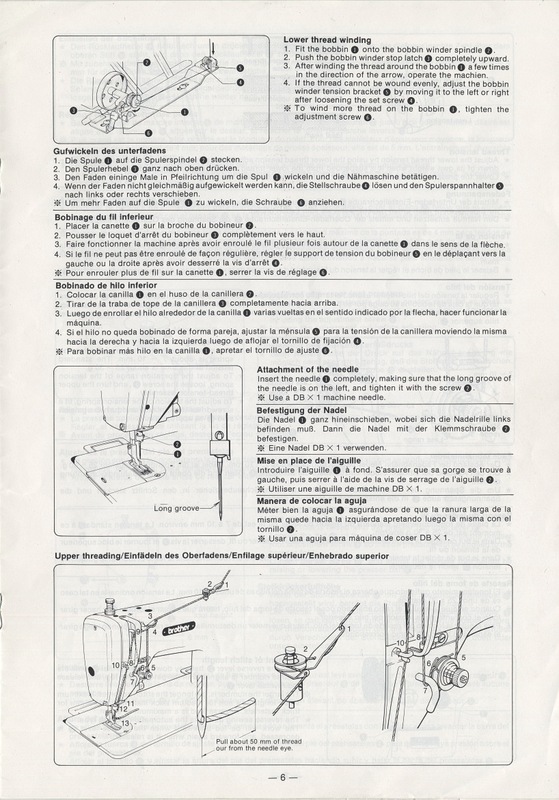 If so, would the standard sort of parts do, or is there a different attachment/presser foot that I would need? Thank you so much. Hi, I changed the oil in my machine and now the oil doesn’t bubble up into the clear oil bubble at the top of the machine. It used to before I changed the oil. Any ideas? Sorry This question is probably so remedial. I have a Brother DB2-B735-3. It is my first machine and first time sewing. I can not figure out what needle size it takes? I understand there are different needles for materials and jobs, etc but the machine takes what a 135×17???? 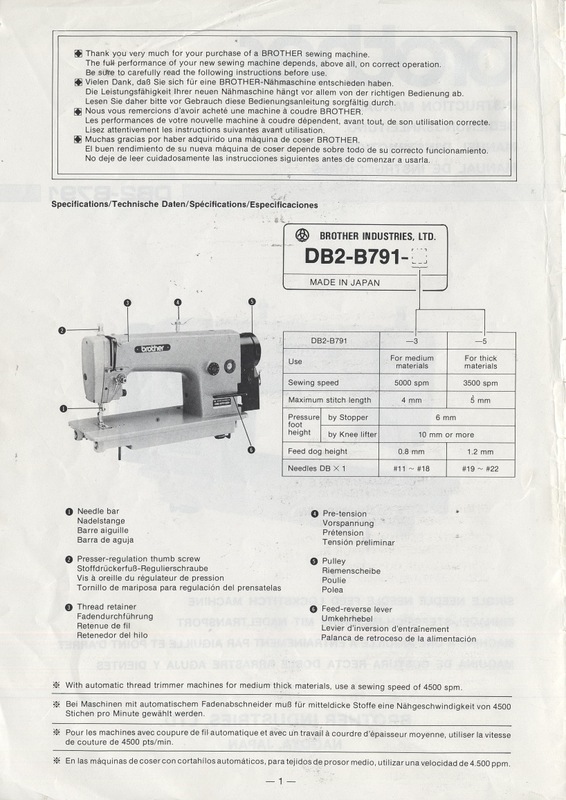 I have the opportunity to purchase a Brother DB2-B735-3. I have a domestic brother and over locker and love them, as well as to industrial Pfaffs, but am out of my depth with this.